Having rich conversation with people in the same interest is Google Spaces APK version 1.3.0.128374512 accomplishment. Before going in-depth about this app, you may read key factor behind the development of this app. Today, social media grows significantly and captures many moments of life. It is place to share what you are doing and thinking. However, there is lack of something essential about sharing specific topic. Some social media offer group feature to attract more users, but it still cannot fulfill what group has to be. Google comes up with idea to provide completely dedicated app for club stay in touch with members. Google Spaces has been released several weeks ago and get positive comments from users. You can create club or group that focuses on something specific. 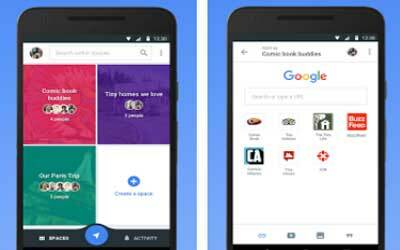 As Google app, you are able to insert other apps from Google that related for group material. Members do not have to quit from group just to watch video because the embedded and integrated system makes anything can be displayed at Spaces. In this group, member can post anything as long as it is suitable with topic. Moreover, unrelated content will be removed automatically. It keeps group stay in the same topic forever without losing to unrelated conversation. Many contents can be posted on this app such as article, photo, picture, video, schedule, etc. When your material comes to group, member can keep on tract with recent conversation. Moreover, you are able to search previous content easily. How does user make group on Google Spaces? Open this app then login with existing account. Create group and type or select topic. Invite friends, colleagues, and others via email, phone, social media, or any communication methods. Once everyone is ready, you can start conversation by throwing first related topic. As time goes by, member will add more contents and your group becomes bigger. Google Spaces for android is what you need to focus on one topic in discussion.